Figure 11-53. Biochemical changes induced during addiction and the development of tolerance, which is followed by withdrawal when an antagonist is administered or by lack in maintenance dosages trigger zone (CTZ), which lies in close vicinity to the emetic center, bordering the fourth cerebral ventricle, above the area postrema (Figure II-55). 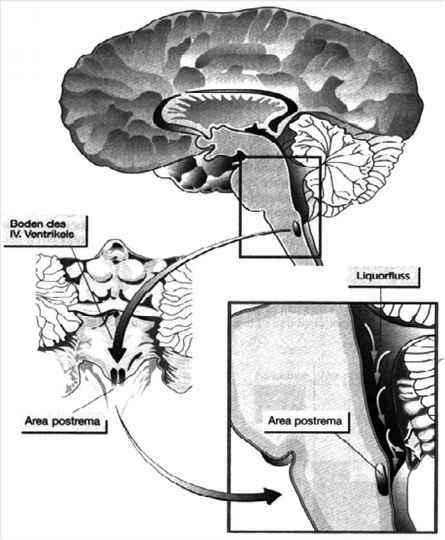 This area is richly supplied with dopaminergic, histaminergic, serotonergic (5-HT3), and cholinergic receptor sites, being the origin of metabolic or drug induced vomiting . • Stop of rhythmical contractions of the stomach, followed by an accumulation of food in the abdomen, resulting in. • Contraction of the cardia with increase of pressure in the stomach. • Due to the coordinated contractions of diaphragm, intercostal muscles and the rectus abdominis muscle, food is being expelled forcefully via the opened orifice of the stomach, the dilated esophagus and the opened glottis. Because the CTZ shows a dense accumulation of serotonin receptors, the serotonin-antagonist ondansetron (Zofran®) is able to induce an antiemetic effect [114, 115]. 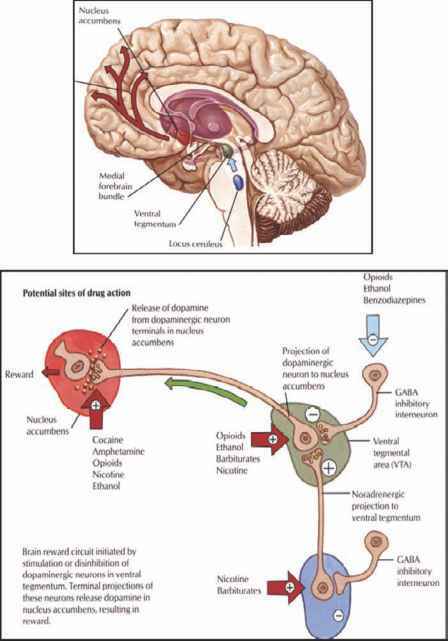 Other agents, which are given for reversal of emesis, are metoclopramide, and/or the neuroleptic agents haloperidol, triflupromazine, or alizapride-HCl, all of which interact through direct binding with the dopaminergic D2-receptor. Another antiemetic is diphenhydramine, which exerts its action via binding at the cholinergic and histaminergic receptors (Figure II-56). Each 30min increase in duration increases PONV risk by 60%, and a baseline risk of 10% is increased to 16% after 30min . The type of operation, the addition of nitrous oxide (N2O), high age and/or the addition of an opioid to the anesthetic regimen, in comparison to the above risk factors, had a lesser impact on the incidence on PONV [117, 118]. The 5-HT3-receptor antagonists are used for both the prevention and treatment of PONV and have a low side-effect profile. They are given toward the end of surgery for greatest efficacy, and are more effective in preventing vomiting than in preventing nausea. Dolasetron, granisetron, and ondansetron all have favorable side-effect profiles. No evidence has revealed differences in efficacy and safety among the 5-HT3-receptor antagonists used for the prophylaxis of PONV. A recent study demonstrated the equivalent efficacy and safety of granisetron and ondansetron when these agents were used in combination antiemetic therapy. In this study, low-dose granisetron (0.1 mg) plus dexamethasone 8 mg was found to be not inferior to ondansetron 4 mg plus dexamethasone 8 mg in patients undergoing abdominal hysterectomy with general anesthesia. The combinations prevented vomiting in 94% and 97% of patients, respectively, in the first 2 h after tracheal extubation, and in 83% and 87% of patients, respectively, in the 24 h after extubation. Dexamethasone has been found to be effective for the management of PONV and their proposed mechanism of action is that of membrane stabilization and inhibition of inflammation. Use of this agent is controversial because of its alleged association with delayed wound healing. It has a slow onset but a prolonged duration of action, and therefore it is advised that dexamethasone be administered upon induction of anesthesia. The most commonly used dose for adults is 8-10 mg i.v. Smaller doses of 2.5-5 mg have also been used and found to be as effective. Based on a quantitative, systematic review of the data, no adverse side effects, especially delayed wound healing, have been noted following a single antiemetic dose of dexamethasone . The neuroleptic drug droperidol, a butyrephenone derivative, is widely used for PONV prophylaxis and is comparable with ondansetron as a prophylactic antiemetic. 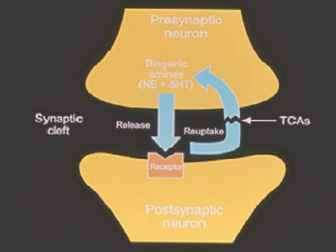 Similar to haloperidol it acts as a dopamine antgonist at the CTZ and the area postrema. For greatest efficacy, droperidol is administered at the end of surgery or concomitantly with morphine via patient-controlled analgesia systems. The use of low doses (0.625-1.25 mg) of droperidol has not been associated with the typical side effects of higher doses of this drug (hypotension, extrapyramidal symptoms, sedation, akathisia, dysphoria). In 2001, the Food and Drug Administration began requiring that droperidol labeling include a "black box" warning stating that the drug may cause death or life-threatening events resulting from QTc prolongation and the possibility of life-threatening torsades de pointes. The labeling requirement was based on 10 reported cases associated with droperidol use (at doses of 1.25 mg) during its approximately 30 years on the market . However, no case reports in peer-reviewed journals have linked droperidol with QTc prolongation, cardiac arrhythmias, or death at the doses used for the management of PONV. Also, in a randomized, doubleblind, placebo controlled trial, droperidol was not associated with a significant increase in the QTc interval in comparison with saline solution . In another recent study, droperidol did not increase the QTc interval any more than did ondansetron . Transdermal scopolamine (Transderm Scop® 1.5 mg), an antimuscarinic ganet, works by blocking the cholinergic receptor. It has an antiemetic effect when applied the evening before surgery or 4 h before the end of anesthesia preventing the patient from post-discharge nausea, vomiting and retching. 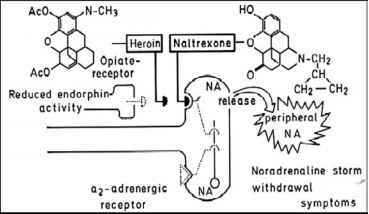 The phenothiazines, promethazine, and prochlorperazine act both as D2- and the H1-receptor antagonist. They also inhibit histamine receptors and possibly cholinergic receptors in the gut. Both have been shown to be effective antiemetics when administered intravenously at the end of surgery. All three drugs may cause sedation, dry mouth, and dizziness. Metoclopramide is benzamide that blocks D2-receptors both centrally and peripherally in the gastrointestinal tract increasing gastric emptying. 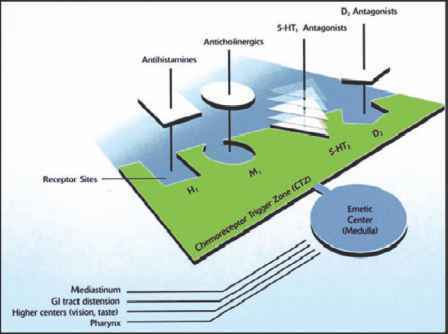 The antihistamines, especially diphenhydramine act on both the CTZ and the vestibular pathways of the inner ear. At higher doses however, they can prolong general anesthesia and recovery times. Consensus guidelines agree that patients at high or moderate risk for PONV are most likely to benefit from prophylaxis. Patients at low risk for PONV are usually not candidates for prophylaxis unless their condition may be compromised by the medical sequelae or vomiting. Those at moderate risk for PONV should receive antiemetic monotherapy or combination therapy. Those at high risk should receive combination therapy with two or three antiemetics from different classes. Drugs with different mechanisms of action can be combined for optimal efficacy. For example, the 5-HT3-receptor antagonists (more effective against vomiting) can be combined with droperidol (more effective against nausea). A multimodal approach that incorporates both baseline risk reduction and antiemetic therapy should be adopted for PONV prophylaxis. A recent prospective, double blind, randomized, controlled trial compared three strategies for the prevention of PONV in patients undergoing laparoscopic cholecystectomy: (1) a multimodal approach using ondansetron, droperidol, and total intravenous anesthesia (TIVA) with propofol; (2) a combination of ondansetron and droperidol, with isoflurane and nitrous oxide-based anesthesia; and (3) TIVA with propofol alone. The complete response rate was higher in the multimodal group (90%) than in the combination group (63%) or TIVA-only group (66%), as was the degree of patient satisfaction. 5-HT3-receptor antagonist. In patients who fail prophylaxis treatment with an antiemetic, another agent than the one used for prophylaxis is recommended.